W1705 - Nièvre - CDF : Atelier « Cuisine ayurvédique » : une journée le vendredi 26 mai 2017 à La Maison - Beaumont la Ferrière (58) - Possibilité d’arriver le 25 mai. Ayurveda, the ancient medical system of India, encompasses the healing of body, mind and spirit through nutrition, lifestyle and rejuvenation. Massages and medicinal herbs accompany these procedures. This art of holistic healing teaches that food can make a vital contribution to good health. Ayurveda can provide much insight about which foods will suit each individual. The workshop is given by Mia. She came to know this encompassing wisdom some 25 years ago. Since then she has studied Ayurveda in both the Netherlands as well as in India. Mia practices this inspiring knowledge for many years now and uses it as a guideline for her own life. By giving massages, cooking workshops and lifestyle advice she makes Ayurveda accessible to others. She is happy to see that more and more people are enthusiastic about the influence of Ayurveda on their health and wellbeing. At 10:00h the workshop starts. Mia will first introduce the principles of Ayurveda. In this short theoretic part of the workshop you will learn about the five elements. Ayurveda teaches that every human being, as well as the entire Universe, consists of a unique combination of these five elements. You will learn how to find out what your own constitution, in Ayurveda called ‘Dosha’, is. 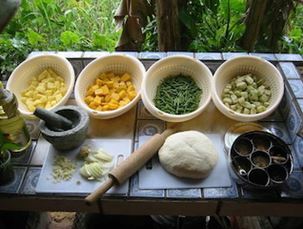 After the introduction we will prepare lunch and some other Ayurvedic recipies. At 13:00h we will have lunch followed by a short walk. At ±15:00h we will again take some time for theory and we start to prepare an extensive Ayurvedic diner. At ± 19:00h it is time for diner, we share and enjoy the food that we have prepared in the workshop. The workshop will be in English. Whenever necessary Christiane and Luc will translate into French.